Sorry for taking so but as described in the email here is the . This was great game to play and to kill time your bored, even though it shows a very dark moment in the world. Interesting game that tries to address a really important issue. I spent the most time with this game, I like the sense of seriousness it gives you as you have to get to the hospital, the controls were nice but were slightly slippery, I'd love to see more done with this. This was the last game I played. Hi people. I have made a video of this game. 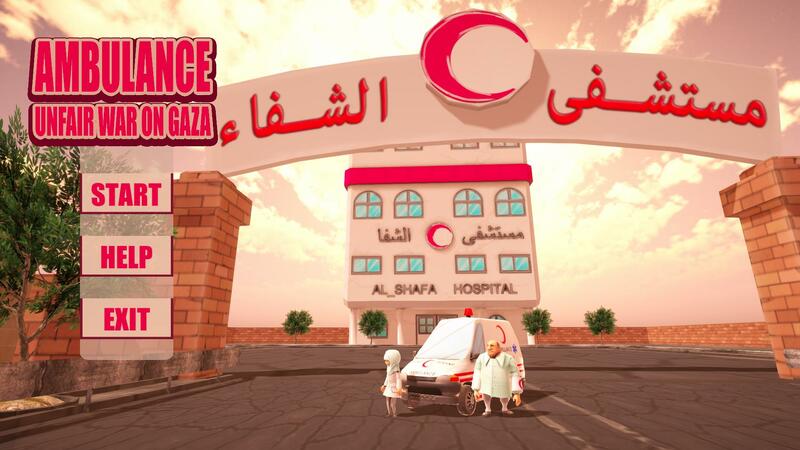 I hope this videogame help the cause and Gaza get the paceful someday. The interesting part about this game is the theme. There's literally no game which covers the topic of Gaza/Palestine. A big hats off to the developers. The game needs a little tweaking before it can be published mainstream. There are a few glitches. I experienced one, and you can watch it in my YouTube video. Thank you so much for video and your honest review. Thanks for the email and sorry it took a while to make, but it's a pretty fun game! It's a little challenging with all the obstacles but not impossible! It ran really smooth, controls were good, and music was good! My only problem was I think it was level 2 or 3 where the crater you had to drive into was reading I was hitting things, probably in the back bumper, because of all the sharp angles, even though I was driving really slowly. But it was still a super fun game on a super serious subject. Here's the video, hope you enjoy! Nice game! Fun and pretty challenging. This was a really great game thanks hammergames for suggesting it to me. It makes you really apprciate what these people go through over there in those parts of the world. Thank you too! Feel free to hook me up with further projects if you want to. Thank you for video and kind words. Really funny car physics. Any game where i can drift is a good game! Another really cool game from you guys Hammer Games! I've played In the name of Freedom Ep. 1 as well and I can proudly say that this is definitely a step in the right direction!! Here's a link of my play-through of this game! This game is very touching whilst still having good gameplay.